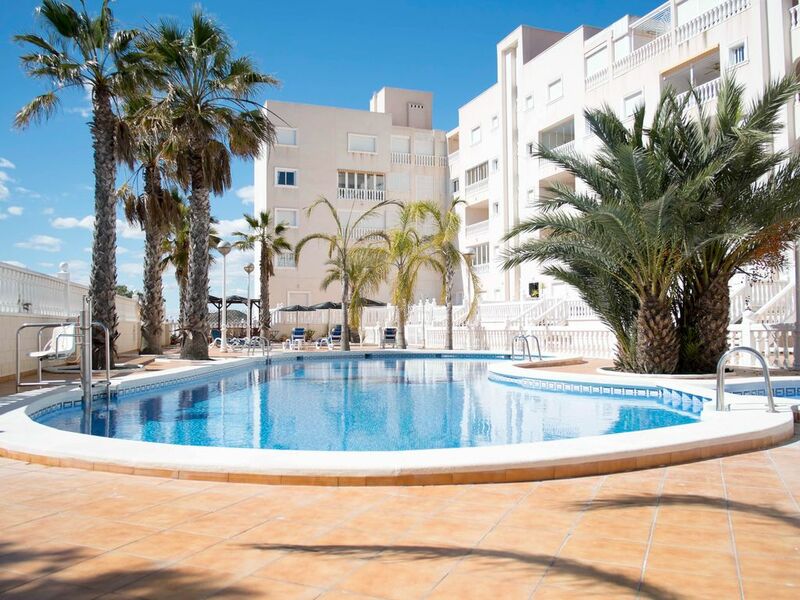 The Colina Real complex (The Royal Hill) is located on the outskirts of the very popular seaside resort of Guardamar del Segura in a quiet, semi rural setting but within a 15 minute walk to the Town. The community facilities include a secure gated entrance, heated swimming pool with changing rooms, toilets, showers, and features for the disabled. Within this exclusive complex we are delighted to offer a top floor, penthouse apartment. The luxury penthouse has spectacular views overlooking the swimming pool & river segura basin, orange, lemon and olive groves and spreading across to the mountains of Alicante and down to the Mediterranean sea. BBQ /Private Chill out on the main terrace. There is also a roof solarium that is ideal for private sunbathing. The apartment has recently been modernised to a very high standard with new kitchen, new floor tiles, new bathroom and much more. We now provide free of change a lovely welcome basket of fruit & pastries, wine, cava,.The apartment is always stocked with tea, coffee & milk. No matter what time you arrive you will can have glass of wine or a hot drink. There is also under ground parking with a lift taking you right to the Penthouse front door. This is not just a hoilday apartment Its a Home from Home. We go the extra mile, with small touches like, body lotion, shampoo and Bubble bath. Thick luxury towels. Beautiful bedding. Key holder on site. Stunning Patio with a Chillout & BBQ area. Under ground private parking space,with lift up to the apartment. Plenty of seating ,room for entertaining. UK & Spanish. Uk free view. There are selection of DVDs to choose from for children & adults . The Pool is heating buy solar heating . Stylish and private with great views, loved the decor and it’s not often you get such a great bed. Staying in the area for bird watching at El Fondo reserve. The local Salt pans also great for birds with an interesting Museum about Salt extraction. Lovely beach and cafe/restaurant at La Marinas near by. We’d happily return, really appreciated the well fitted out kitchen and having dinner in the dining room was great at night, super views. This wonderful apartment is amazing we loved every minute we where here. Views from every window took our breath away. The apartment was large with lots of light very clean and beautifully decorated. We loved this place so much I don't have the words to do it justice.all I can say is go and experience it yourselves I guarantee you will not be disappointed. We would recommend a car as it is a little out of town but on a beautiful clean urbanisation. We did manage without one as we enjoyed the walk into town, and used buses to visit Santa Pola and la Mata. But if you want to explore the area then it would be easier with a car. Thanks to Kellie and Mark for hiring out your fabulous home. Thank you so much for your amazing review. So glad you had a good time. Hopefully we will see you again soon. Mark and Kellie. Absolutely brilliant apartment. Could not fault.. This apartment ticks all boxes. My wife and I really enjoyed the stay. Totally relaxing holiday we had there. Looking to return next year. This was our second time staying at the Colina Real Complex, this time I found Kellie and Mark's penthouse apartment. The fabulous apartment was very spacious and has a wonderful outside area, this really added to the apartment. The apartment was clean and tidy. The pool area was great and we often had the pool to ourselves, it was very quiet. Kellie and Mark were very helpful, as was Fay a lovely lady who met us with the keys and showed us round. I would highly recommend this apartment for anyone looking for a quiet relaxing holiday. If we go back to Guardamar I will be in touch to stay again. The apartment has a lovely feel about it, we felt very at home. Thank you Kellie and Mark. Our stay in Kellie and Mark's wonderful apartment was better than we expected. The penthouse itself is well appointed and furnished and caters for every need. We will definitely recommend to all our friends and family. Kellie was really helpful whenever we had a question. Thanks Steve. Really appreciate it. So glad you had a good time. Hopefully see you again soon. Mark and Kellie.